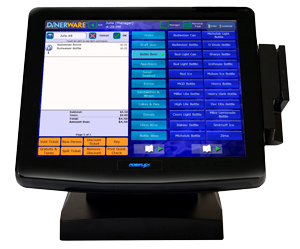 So you’ve been doing your online research and are sold on Dinerware POS software for your bar and grill type restaurant but now you need to get a Dinerware integrated merchant account so you can accept credit card payments? If you are shopping Dinerware credit card processing options, there are some things you probably should know, some “secrets” if you will, before you select a provider. This page is written to help restaurant owners and general managers fully appreciate the differences between processing options available and make an informed decision. Whether you are opening a new mom-and-pop restaurant or switching to Dinerware from some other restaurant POS system, this is a post you must read – especially if you like saving money and finding the best deal out there. We know the type. We are that type too! Will there be a fee to set up credit card processing? What are the rates and fees for processing? The first thing you need to understand is that Dinerware only has a couple endorsed integrated payment processors authorized to provide secure payment services. If you don’t use one of these certified processors, Dinerware will charge you a $595 one-time gateway software fee for the Integrated CCP Module and another $595 one-time fee to accept gift and loyalty cards using the ‘Integrated GC Module’. That’s $1190 to accept both bankcards and gift/loyalty cards. Ouch! If you’re the type that likes to save money, that probably doesn’t sound so good, eh? But there is good news. If you use an endorsed payment processor, there are no processing add-on/plug-in software fees. Basically, the license to use these modules is free. If you are opening up a new restaurant, this is probably no big deal because you can simply open an account with an endorsed processor. If you are switching from one POS system to another, it is probably smarter to open a new merchant account with an endorsed processor to avoid the big setup fees. You can always keep you current processor if you don’t mind paying this fee but do you really want to pay to use some other processor knowing you can avoid that fee and probably get a better deal if you switch? The endorsed processors will probably all match or beat the rates you currently have but not all are created equal when it comes to a Dinerware merchant account. This is the most transparent form of pricing that will allow you to compare rates and fees between processors on an apples-to-apples basis. Interchange plus pricing is always quoted at basis points over interchange with a per transaction fee. If anyone is quoting you tiered pricing, it’s probably not the best deal out there. With tiered pricing, the processor makes larger spreads on certain card types, aka “downgrades”. These are deceptive because they typically feature some attractively low priced “qualified rate” but hammer you on anything but signature debit. Keep it simple and transparent. Interchange plus pricing is almost always better. Who has the lowest processing rates for Dinerware? From our years of experience in the payments business, we find First Data almost always wins in the event of a pricing battle in the retail vertical. First Data is the largest payment processor in the world, the 800lb gorilla in the industry that dominates the retail vertical. With the larger scale, First Data can go lower than the other smaller players. If you already have processing with some other processor, send in your statement and ask for a proposal — see if First Data can beat it. Restaurants that switch to a First Data account can typically save hundreds of dollars every month. This is how quickly you will receive your money. Most processors won’t disclose their funding times because they are at a disadvantage but we think this is an important ‘secret’ to know. To our knowledge, the only processor that supports next day funding is First Data. Again the standout in the crowd. There appears to be a theme evolving here. As you have probably guessed by now, it just so happens we are an independent sales channel for First Data merchant accounts and can get you set up to accept credit cards with Dinerware in 24 hours.